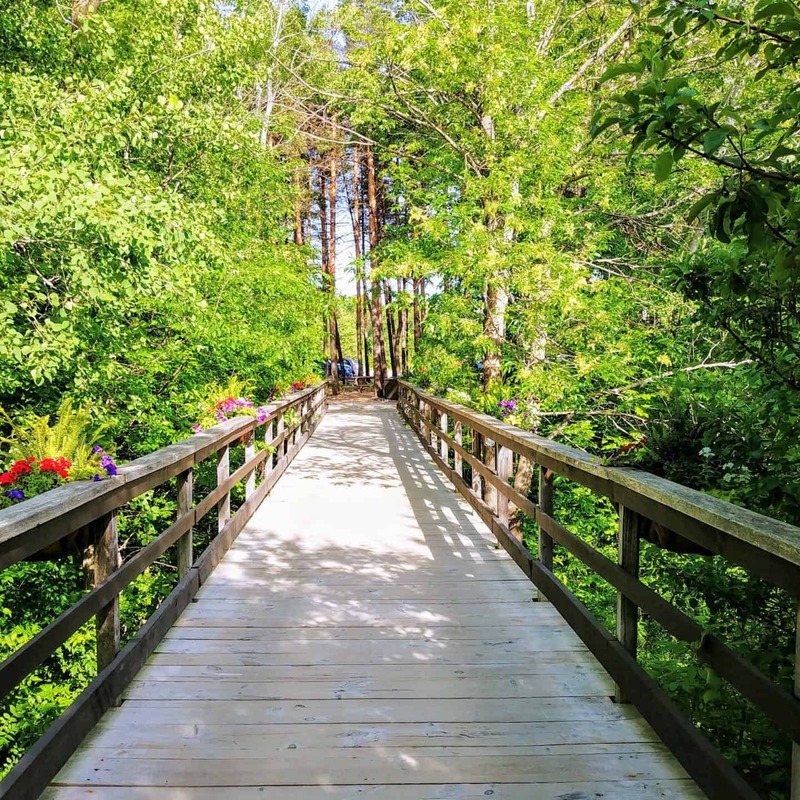 Life is busy and finding much needed time to unwind and rejuvenate isn’t always easy but it sure is important to our wellness. 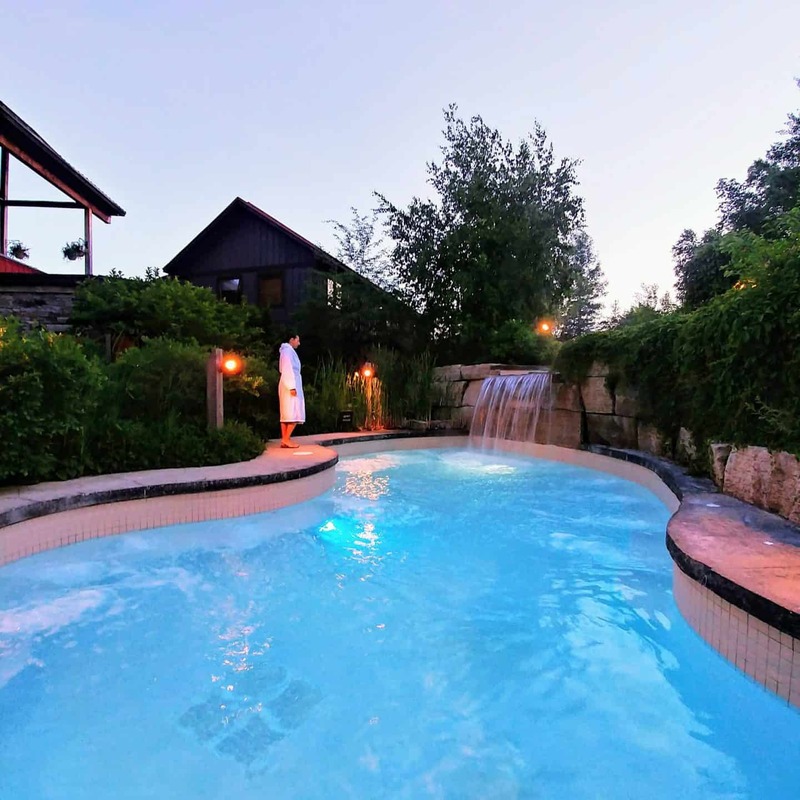 My husband and I are no strangers to Scandinave Spa at Blue Mountains and frequently visit. 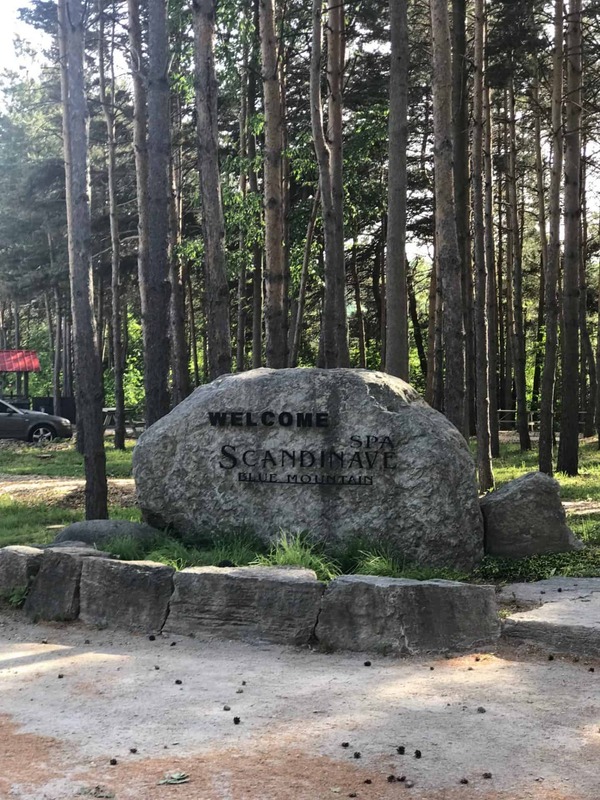 Where else can you relax in the heart of nature while enjoying the Scandinave Baths? There simply is no other experience like it. Since it is a tranquil phone free environment, it is the perfect place to unplug and relax. We actually did unplug for most of the weekend and it was extremely beneficial. Heading to the spa on a Friday afternoon was the perfect way to end a busy week, to relax, reflect and rejuvenate. In just under two hours, we were worlds away in a tranquil, beautiful setting. We like to treat ourselves to the Scandinavian Package when we visit. It includes a 60-minute Swedish Relaxation massage, robe rental, and access to the Scandinavian Baths. Starting with the relaxation massage is the perfect way to take relaxation to the next level. After our massage, we headed off to enjoy the baths and saunas. The first stage includes heating the body up which dilates the blood vessels on the surface of the skin, reduces blood pressure, and increases blood flow to the skin and muscles. This also helps to cleanse the skin. I alternate between all of these. A Eucalyptus steam bath is stimulating, removes exhaustion and mental sluggishness and rejuvenates the spirit. Eucalyptus oil is known for its antibacterial, anti-inflammatory, antispasmodic, decongestant, deodorant, antiseptic and stimulating properties. Traditional Finnish saunas usually use dry heat, with a relative humidity that is often between 10 and 20 percent. Infrared saunas are wonderful for detoxification, relaxation, skin purification, improved circulation and may also help with pain relief and weight loss. Who doesn’t like a nice hot bath? It is so relaxing sitting in the hot baths and letting your day just melt away. The second stage includes closing the pores of the skin with a brief, but, highly beneficial cool rinse. A dip in the cold plunge bath helps to release endorphins, and increase your heart rate. This stage is where you will receive the most benefit from the hot-cold-relax circuit. I will admit, I don’t always plunge in the cold baths. I typically do not like the cold so I usually opt for a cold shower. My husband enjoys the cold plunge baths and finds them extremely invigorating. The final stage is to allow the cardiovascular system to regulate itself. After spending time in hot and cold environments, it is recommended to rest the body to help stabilize blood flow and heart rate. We love sitting in the solariums and taking in the beautiful sights of nature. The outdoor fireplace is a great touch as well, especially in the winter time. They also have hammocks and Muskoka chairs to lounge in. My husband and I will usually do this circuit half a dozen times. Let’s be honest, I can stay here all day. Once we are ready to leave the spa, we are completely relaxed. By this time we have forgotten about the hard long work week, the city traffic and anything else life has surprised us with. For the perfect ending to the perfect spa evening, we decided to spend the night at a local bed and breakfast. 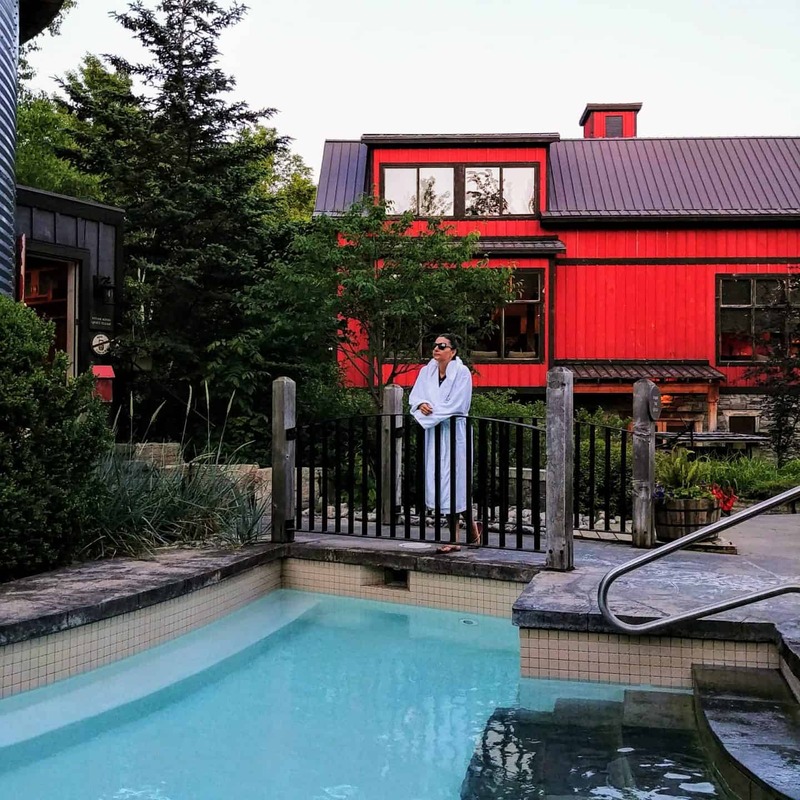 We wanted to stay somewhere quiet that would be the perfect ending to our spa evening and further allow us to decompress and reconnect with nature. 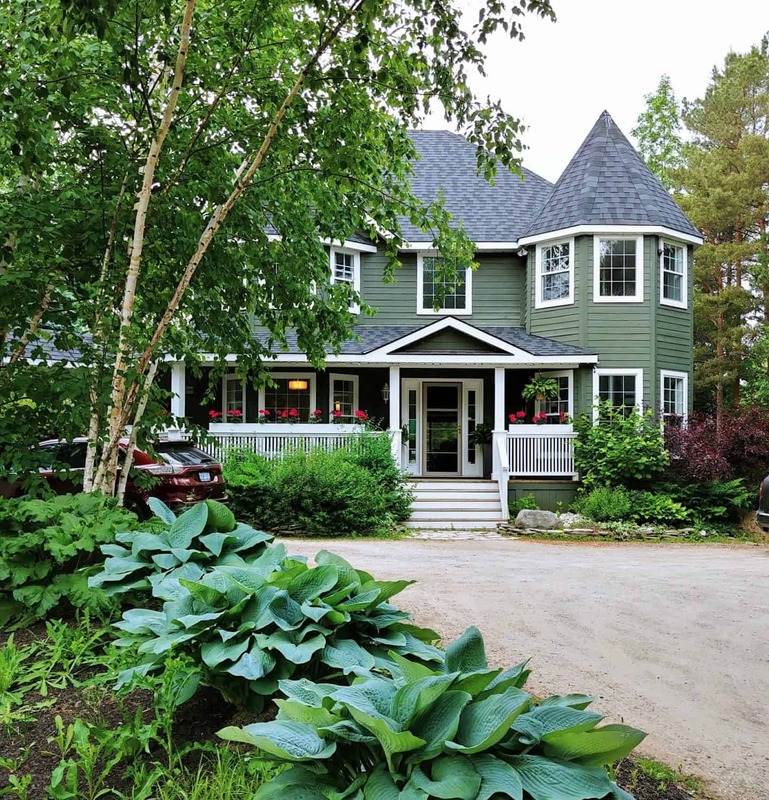 Craigleith Manor B&B is the perfect B&B located a short 5-minute drive from Scandinave Spa and is nestled between Georgian Bay and the Blue Mountains. 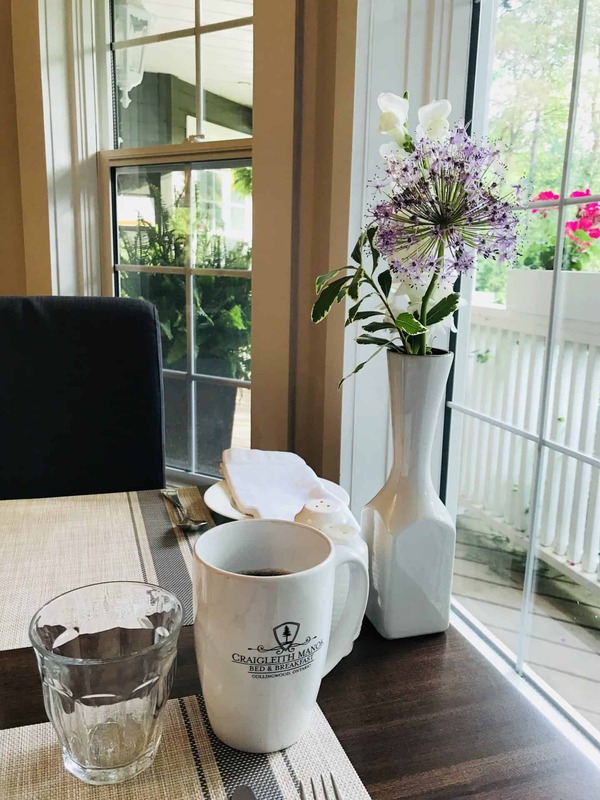 This is our second time staying at a Bed & Breakfast and we absolutely loved it. Nothing tops the service you will receive staying at this beautiful B&B. 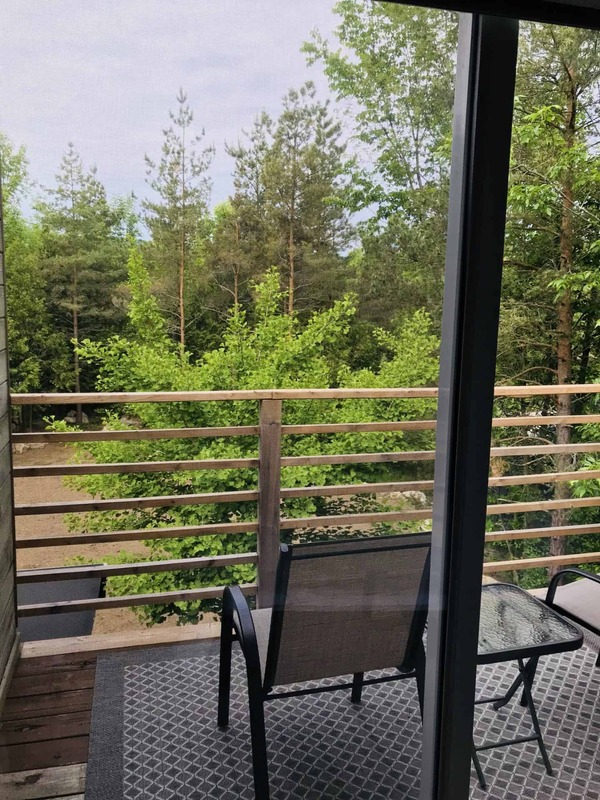 We stayed in the tranquil forest suite that takes in the serene forest views and along with our own private balcony. We had an amazing sleep on the very comfortable queen size bed and all the amenities that let us feel like we were at home. Our ensuite bathroom contained luxurious spa amenities such as Gluckstein Spa Collection plush 100% cotton towels, a large shower with adjustable rain head spout, heated floors, 100% plush cotton robes, Neutrogena shampoo, personal hand soaps, body wash and body lotion. After a restful sleep, we woke up to the aroma of freshly brewed coffee. Breakfast menus are prepared daily and guests get to choose from a variety of hot and cold options. 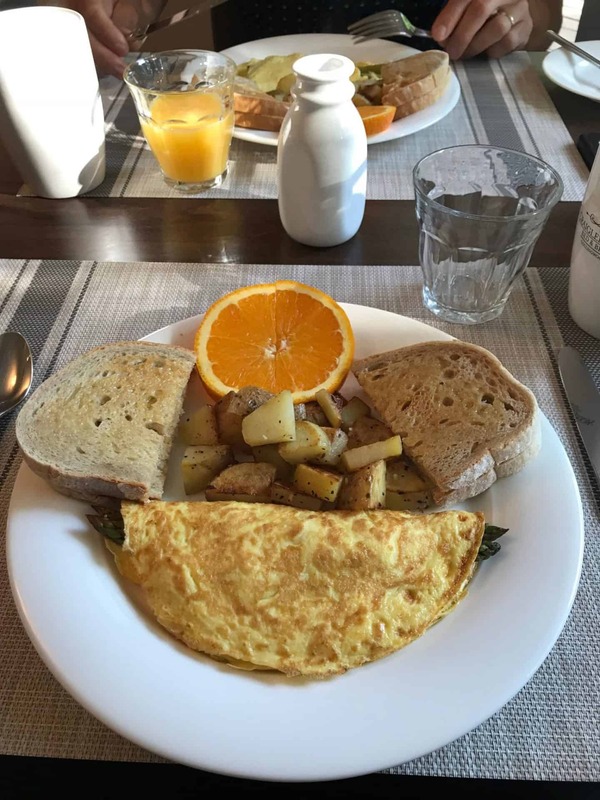 We chose the delicious asparagus omelet with parmesan cheese, roasted potatoes and toast. We also had fresh yogurt with gluten free granola and fresh berries. After a wonderful breakfast, we headed out to explore the local Farmer’s Market. 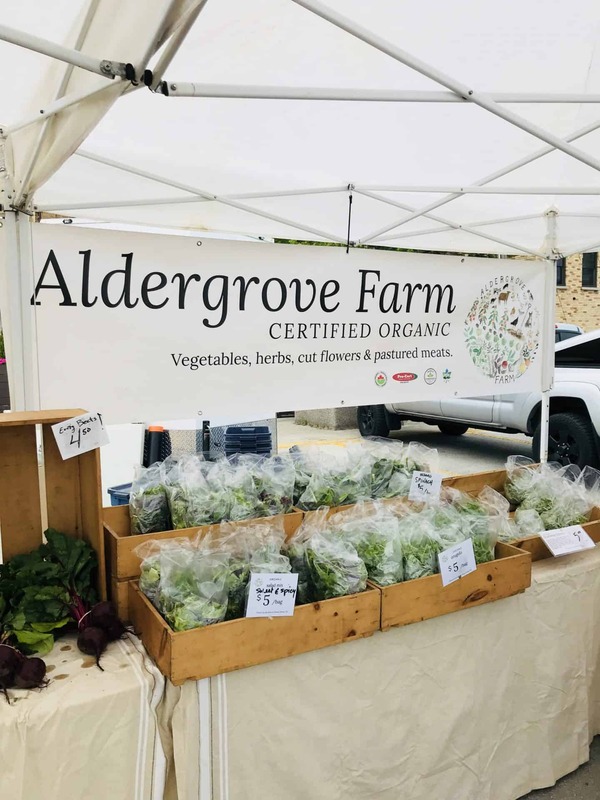 This year the Collingwood Farmer’s market kicked off their 13th season and will remain open until the Thanksgiving weekend. We love strolling through local farmers markets. We were excited to see fresh picked strawberries and asparagus. When shopping we always try to buy fresh, local ingredients and this was the best way to stock up on local produce. The Collingwood market features produce vendors, local baked goods, crafts and artwork. If you are able to visit on the weekend then the Farmers’ Market is a must stop as it is an integral part of the downtown Collingwood experience. We purchased a delicious apple berry pie from Tansy Organic Apple Farm. This is a family owned and operated apple orchard that has been certified organic for thirty years. They have so many delicious baked goods to choose from. We couldn’t resist the freshly baked bread from Aster Lane Bread. 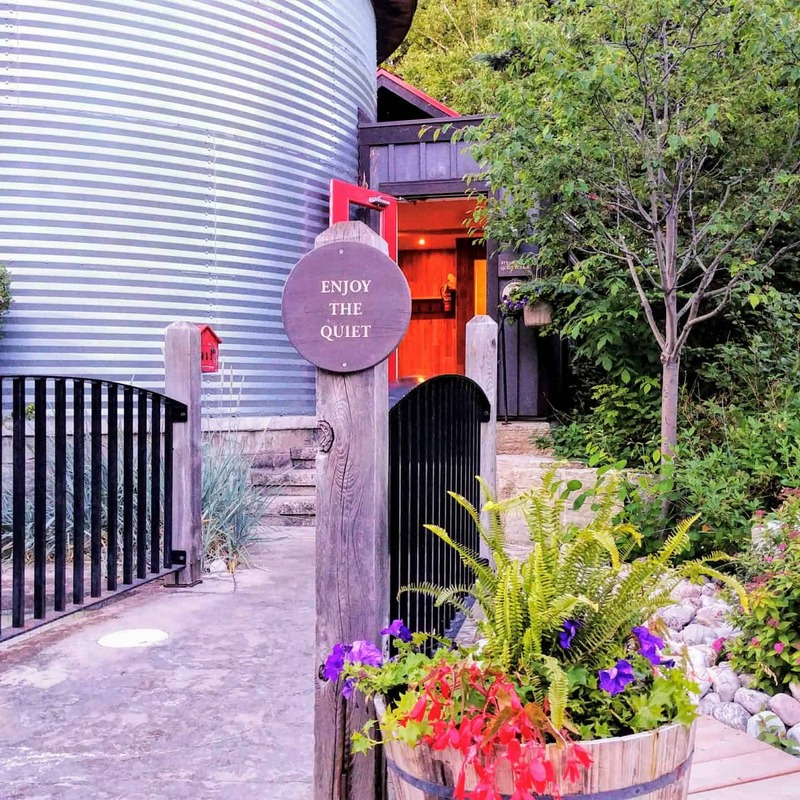 They use a wood-fired brick oven to bake real sourdough bread. All of their bread is made using local, organically grown grain. The flours used are real whole wheat or lightly sifted; they do not use white flour. All of the bread is naturally leavened for better health and flavour and they do not add commercial yeast. It’s important to take time for yourself and visit the Scandinave Spa to unwind and relax after a long work week. 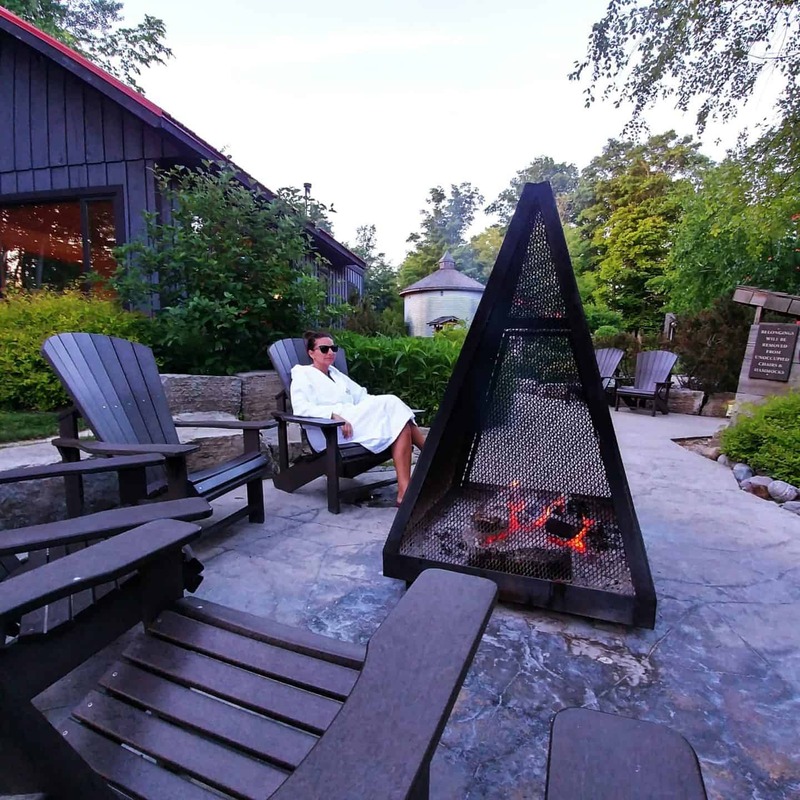 You should plan your summertime Scandinave Spa Blue Mountain experience in advance to avoid disappointment and ensure a smooth and relaxing visit. Life can be so complicated and sometimes stressful, so it’s so important to maintain a healthy mind as well as a healthy body. 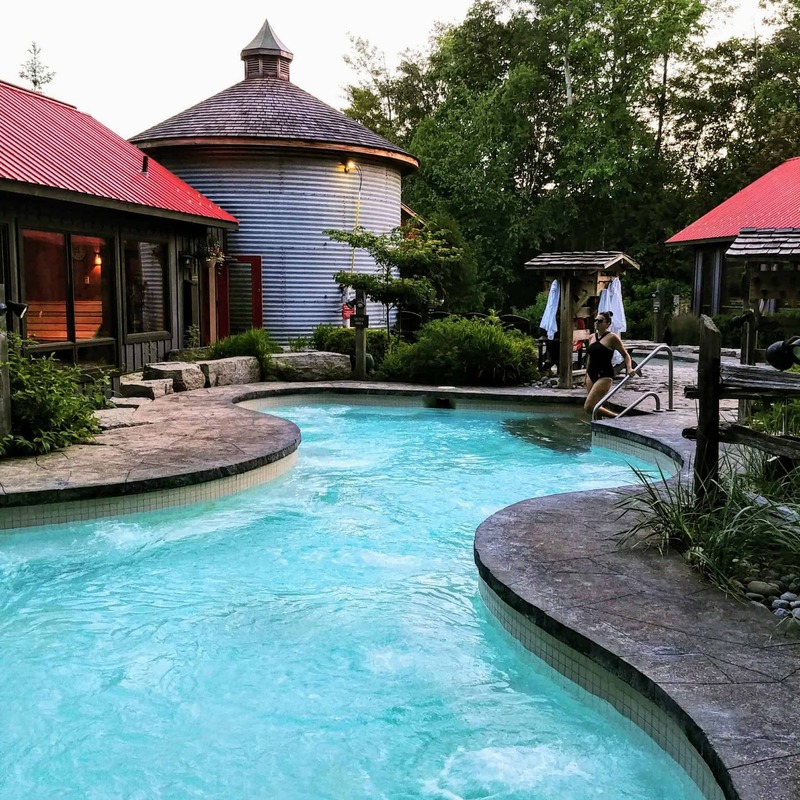 One of my favourite ways to do both is this spa getaway at Scandinave spa and everyone I know who visits all agree ….this is the perfect place to de-stress, unwind and truly relax! 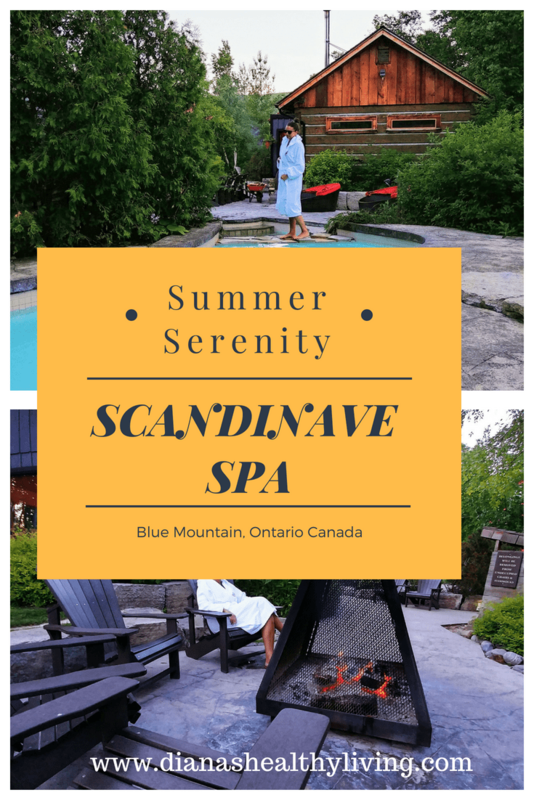 This post is written in partnership with Scandinave Spa Blue Mountain. As always, all opinions are my own. A huge thanks for a wonderful getaway. It looks beautiful! I’ve been to the scandinave spa in Whistler but i skipped the cold treatment! Maybe one day if I go in the summer, I’ll do the full steps! I totally skipped the cold treatment but my husband loves it.